American correspondent Major Garrett had married a long time ago and his marriage still is going as smooth as butter. The California native is best known for being the Chief White House Correspondent for CBS News. He also hosts the Takeout Podcast for the CBS news, along with taking helms of the post Correspondent at large for the National Journal. On 13th January 2009, Major was hired as the senior White House Correspondent for the Fox News Channel. Born on 24 August 1962, 55-year-old Major attended James Madison High School in San Diego. He graduated in 1984 from the University of Missouri with a Bachelor of Journalism. Major started his career by working as a senior editor and congressional correspondent for The Washington Times in 1990. In early 2000, he served in White House Team in CNN. After two years, he was appointed as a general assignment reporter in Fox News where he worked as the network’s congressional correspondent and even covered the 2004 election. Major become an award-winning reporter across the country while working as a White House correspondent for CNN. He also penned various articles for the different magazine like The Weekly Standard, Washington Monthly, and Mother Jones. Later, on 3rd September 2010, he left the channel and moved to National Journal. Major is also the Chief White House Correspondent with CBS News and a Correspondent at Large with National Journal. As of now, Major hosts the Takeout Podcast which is a weekly podcast about politics, policy and pop culture. With a legendary mark to his field, Major has not only become a successful person but has made his financial status strong. His estimated net worth is $3 million, but his current salary remains confined to the date. Major's Highly Anticipated Book Is On The Way! As a person who has been closely covering the presidential drama in Washington on a daily basis, Major Garrett is finally opening about those events in his new book, Mr. Trump's Wild Ride. The book that contains explicit details about Trump's presidential reign till date is hitting the shelves on 28 September 2018. The book is a microscopic look on Donald Trump's term through the lens of issues headings like race, immigration, Jeff Sessions and Neil Gorsuch. Major has also delved into the topic of Donald Trump being extremely focused on appearances from the campaign trail to the Oval Office. Major has not only revealed the bigger issues in the book, but also minor details which portrays himself as a vain. In one of the book's chapter, The CBS correspondent writes about Donald Trump forbidding his aide Brad Parscal standing next to him in official photographs, so that he would not be seen shorter than him. Major in his book has forecasted the effects of Donald Trump's presidential term and believes that his effects will last for a long time, despite mixed responses from the public. And Garett believes that to be Trump's key victory. 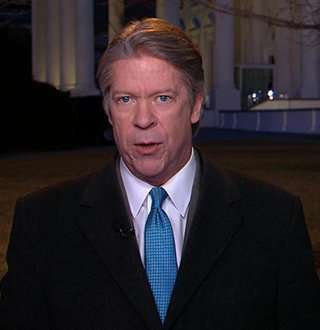 Veteran Correspondent Major Garrett is married to Julie Kirtz, who is the Editorial Director at the Wakefield Research, in Washington D.C. The pair tied the knot in 1990 in an excellent wedding ceremony among their family and friends, but it remains unclear where they shared their vows. Well, Major and Julie, from their long and illustrious marriage, share three children. But the names of their children remain confined from the media. However, it came to the light` that all their three children have been able to establish the successful career in their respective fields. Moreover, Major and Julie have also mentioned to their close friends and family that they wish to renew their vows on their anniversary. They reasoned their wish stating that when they married twenty-eight years earlier, they promised each other a lifetime of love and have been successful in doing so. So to celebrate that success, they yearn to renew their vows. Though nothing more about their married life has been revealed to the media, it's apparent that Major and his wife are enjoying their peaceful and happy married life.